Purchase the score and parts together and receive 50% off the combined price! Sarasate's Zigeunerweisen has become a popular challenge for young cello virtuosos and advanced students. It is not a rarity to hear them play the piece quite well, even brilliantly, which tells us to what extent the technical level of cello playing has improved over the past years. 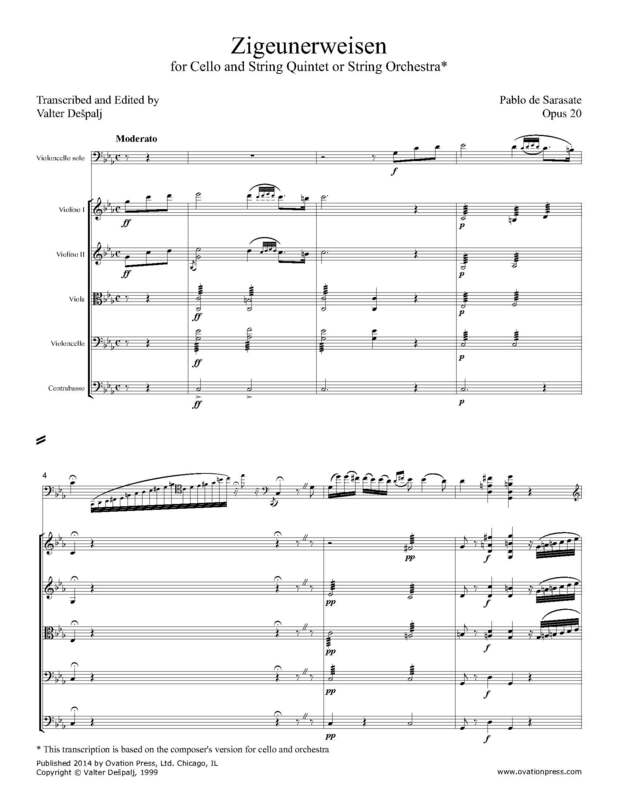 Since my students sometimes get the opportunity to play a short solo piece with a string ensemble, that motivated me to make this transcription for cello and strings. It is based on the composer's orchestral version, where the orchestration leans almost entirely on the string section. As such, it was necessary to incorporate some significant elements of the wind section to result in a more complete sound. As the soloist basically plays an octave lower than is written for the violin, small adaptations were made in the accompaniment as to adjust the sound and balance.